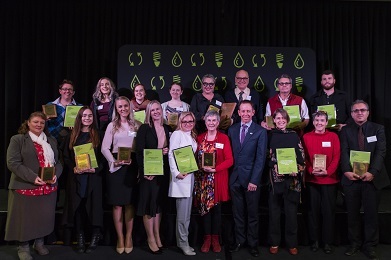 Actsmart sponsors the Business Sustainability Awards to recognise those organisations that make an outstanding contribution to sustainability across Canberra and the broader ACT. Each year, the Business Sustainability Awards — which have grown in terms of both participation and prestige — are presented at a gala breakfast, with all registered Actsmart enterprises invited to attend. Nominations are now open for the 2019 Actsmart Business Sustainability Awards. Entering the awards is easy and a great chance to share your sustainability message. Winners are promoted to other Actsmart organisations, media and the wider Canberra community. It’s a fantastic opportunity to be recognised for your efforts and celebrate your commitment to sustainability. Decide which category or categories your project or initiative bests suits. Review the award categories and criteria and terms and conditions. Supporting documentation in the way of photos, graphs or statistics can be submitted through the online nomination form or can be emailed to actsmartbusiness@act.gov.au. Please clearly outline your organisation and the nomination it relates to. Awarded to the organisation that has the smallest amount of waste going to landfill. This is worked out as a percentage of the overall waste composition. You can refer to your Actsmart scorecard for this information. Nominations for Actsmart events will be worked out as a daily average. Recognises a business who has implemented energy and/or water saving initiatives and successfully reduced their consumption through efficiency upgrades, staff behaviour change and/or innovative projects. Awarded to an organisation or public event that has implemented an innovative idea or creative process to support energy and water efficiencies or improve waste management. Awarded to an organisation or public event that has implemented an effective staff motivation system to support energy and water efficiencies or improve waste management. Awarded to an organisation for outstanding performance in making sustainable business practices the cornerstone of its business development strategy. Awarded to a small business (with less than 20 full time equivalent employees) for achievement and leadership in adopting energy, water or waste practices that reduce its environmental impact and strengthen its commercial viability. Awarded to an individual for outstanding leadership in management of waste abatement and/or energy and waste efficiencies and best demonstrating the spirit of the program/s. For further information on conditions of entry for the Business Sustainability awards, click here. Ausvet are very conscious of the environment and always looking for ways to reduce their impact and carbon footprint. All their items are sorted into compost, recycling and secure paper with only 2% of waste going to landfill. This year’s waste minimisation winner was hard to beat. Prior to starting the program this large organisation was sending 94% of their waste to landfill. Working with the Actsmart team, Elections ACT have reduced that to an impressive 1%! The Canberra Hospital separates its waste into nine different streams, and diverted over 250 tonnes from waste to landfill between May 2017 and February 2018. In just two months, 2.5 tonnes of organic waste was processed using their new organics machine, ‘Feed Me Solutions’. The Earth Festival diverted over 368 kg of waste from landfill at their event held in April 2018, and hopes the event will be 100% waste free in the future. Over 5,000 people attended last year’s event. With five waste streams available 1,950 kg of material was recycled including bottles, cans and cardboard resulting in more than 67% of total waste diverted from landfill. The 2018 festival attracted more than 200,000 patrons, who recycled an outstanding 8,829 kg that would have otherwise gone to landfill. As a result of energy efficient upgrades by the association and scout group, electricity use reduced by more than 5,100 kWh, eliminating 4 tonnes of CO2 pollution and saving over $1,000 on electricity bills per year. This salon has committed to making environmental changes. Easy dry towels are 100% water saving and biodegradable. New water efficient taps have reduced water use by 56%. A new shampoo buy back scheme helps customers recycle. Only 13% of waste is sent to landfill. Little National Hotel is environmentally savvy, reducing printed pages from more than 150,000 per year to zero to become completely paperless. The hotel has installed over 100 solar panels, which produce more than a third of the power used at the hotel. The QEII Family Centre has been helping families since 1926. The team put together a short film to motivate and educate staff and visitors on the importance of responsible waste management, encouraging them to make conscious decisions when dealing with their waste. The US Embassy’s Canberra Greening Initiative team finds new ways to motivate staff and family members to improve sustainable business practices. Their ‘Art from trash’ competition proved to be a successful motivator, and allowed people of all ages to be a part of a great initiative. This construction company has sustainable practices and has creatively used plastic drink bottles and rice husks to replace up to 20% of aggregate without reducing the strength of the wall being built. ‘The Link’ by Ginninderry is a sustainability focused education facility that showcases sustainable building design and practices. Thinking outside the box, ‘The Link’ has implemented solar panels, organic compounds and its very own ‘Air Bee and Bee’—a native bee hotel. Jenni Tarrant, owner of Bond Hair Religion has been in the hairdressing industry for more than 35 years. Jenni prides herself on the success of her salon and is responsible for developing the initiative to make a positive environmental change by reducing waste dramatically within the salon. The Business Sustainability Awards recognise the outstanding achievements of businesses and public event organisers in the efficient use of water and energy, better waste management and recycling practices. It also celebrates achievements in projects representing exemplary sustainability practices. After joining the Actsmart program in 2010, the Office of Public Trustee and Guardian for the ACT added mixed recycling and organics resulting in a reduced waste to landfill of only 4% - a target they should feel justifiably proud. Prior to joining the program this demolition and earthmoving company sent 67% of waste to landfill. With the help of the Actsmart program they have implemented mixed recycling, paper and battery recycling as well as organic recycling, now sending a tiny 3% of waste to landfill from their office. This result is only matched by their ability to send 98% of waste from their demolition jobs to recycling. One of the largest hospitals in the ACT, Calvary Public Hospital in Bruce has implemented 29 waste streams. Between May 2016 and April 2017 they sent 153.8 tonnes to recycling – equivalent to 10,170 household recycling bins. This year the event saw a reduction of waste to landfill and a 78% increase in recycling. Putting their innovation and ideas brand to work saw strategic implementation of mixed recycling and organic bins placed throughout the event, creation of a sustainability checklist for caterers and donation of leftover food to OzHarvest. They even required all cutlery and drinking cups, to be made from recyclable materials or biodegradable. Over 200,000 people attended this year’s three-day National Multicultural Festival. The event more than doubled the volume of recycling than any previous years with 12.3 tonnes of material being recycled. Recycling with enthusiasm and innovation, Kicks Entertainment set up 240 recycling bins at the front of house area of their event in Commonwealth Park. They also had 1100 litre containers to maximise recycling in the back of house. By implementing a $1 deposit scheme for drink containers this incentivised patrons to return containers for recycling, as well as minimise litter and the impact to surrounding businesses. Using Actsmart water refill stations the event reduced the number of drink containers sent to landfill. The lighting at this Woden facility had not been upgraded since the 1960s and brought many challenges to the team at Squash ACT. Identifying suitable options for squash court lighting upgrades has resulted in an annual saving of $1,300 and 4.53 tonnes of C02 with players commending the improvements. Working with the Actsmart Energy and Water Program, this 24 hour facility recognised there were opportunities to reducing their greenhouse gas emissions. Installing 150 LED light panels will save them approximately $4,928 per year in energy bills. It will also reduce energy by 27,000 kwh per year – equivalent to about 19.3 tonnes of C02 emissions. With most timber pallets being sent to landfill boyandgirlco saw an opportunity to turn pallets into functional, stylish and sustainable custom furniture. Since starting operation in 2013 this sustainable company has diverted 11,000 timber pallets from landfill – equivalent to the weight of 100 African Bush Elephants. Taking responsibility for their impact on the environment Griffin Legal joined the Actsmart business recycling program in 2013 to reduce waste to landfill by 29% - despite an increase in their workforce by 30%. Becoming a paperless office required staff to create new work habits and processes. They participated in an ANU study on workplace recycling habits and encourage staff to walk to meetings, take public transport and ride to work. After implementing the Actsmart program, KPMG staff are dedicated to making a difference. They are educated and motivated with pass/fail signs on recycling bins. They also participate in office harvest where staff bring in excess food for sharing. After joining the program in 2013 the Australian Sports Commission implemented their own on-site organics system, transforming a clay tennis court into a worm farm. Now with more than 160,000 worms and four worm farm beds, the project recycles approximately 3,400kgs of organic waste per month. Ollie is responsible for the profound impact on waste reduction throughout the US Embassy in Canberra. Ollie has shown innovation in reaching out to the entire embassy community across Canberra. He has increased awareness for hundreds of local citizens and shown leadership to the diplomatic community. Brema Group specialise in demolition and excavation with a real focus on recycling. They joined the Actsmart program in April 2012 and have achieved fantastic results, diverting a staggering 97% from landfill through recycling, and reducing CO2 emissions by 1.7 tonnes per annum. Gaining accreditation in the Actsmart program in May 2012 saw Elections ACT see some real and tangible results. After implementing the program, the small office reduced waste to landfill from 14% to a mere 3%. A major focus was minimising waste generated by cost sharing technologies with other electoral offices and borrowing election materials where appropriate. The 4th July event is the biggest event held at the Embassy with 800 guests at the 2014 event. Installing portable Actsmart signage saw an immediate effect on visitor behaviour. 1680kg of organics and mixed recycling was diverted from landfill to recycling through the event. The success of this recycling effort is the benchmark for all future events at the embassy. The Wanniassa Hills Primary School fair held in October 2014 saw 1000 visitors having access to recycling. The team at Wanniassa Hills Primary accessed the Actsmart bin covers and set up stations around the event. Students were instructed on use of the bins to model behaviour for visitors to the event – resulting in 58% of waste being diverted into recycling. The National Folk Festival has a strong background in recycling at its events, and in 2015 through partnering with Actsmart they exceeded their high standards. In 2015 a staggering 7.8 tonne of organics and 6.1 tonne of mixed recycling was sent for recycling from the 50,000 visitors who attended the event. The result was that 53% of waste was diverted away from landfill, a fantastic effort for such a large event. The National Library of Australia embarked on a four year journey to maximise recycling joining the Actsmart program. They installed signage in docks and kitchens, and offered recycling options in the coffee shop which encouraged staff, visitors and contractors to help reach recycling targets. The Library now recycles batteries, cardboard, metals, fluorescent and mixed lighting, organics, paper, timber pallets, printer and toner cartridges, and soft plastics. Joining the Actsmart Energy and Water program this small not-for-profit childcare centre embarked on an ambitious challenge of upgrading a 1970s building to 2015 environmental standards. All toilets and taps were upgraded, hospital grade hand sanitisers installed to reduce water usage, a 6 star rated plywood floor installed, and new roofing and gutter systems to maximise water recycling for irrigation to vegetable gardens and toilet cistern use. This childcare centre focussed on reducing its energy use by replacing an out of date electric hot water system with a new efficient model, replacing old lights with LEDs, heavily insulating the roof, and replacing old windows to double the size of the glass and allow for 180 degree opening. This allows more light to enter the building and better ventilation - resulting in 75% of the building not requiring artificial light for most of the year. Class Locksmiths embarked on their energy efficiency journey with Actsmart by replacing 230 fluorescent tubes and a dozen halogen lights with LED lights. A reduction of 50% of power usage was achieved. Class Locksmiths also embraced staff behaviour and encouraged staff to turn off equipment whilst not in use, installed timers for water boiling units and applied film on large glass panels in showroom to reduce heat in summer. With the advice from the Actsmart audit, the church set out to convert the 1990s building to make it more comfortable as well as energy efficient. Installing an efficient split system heating system, scheduling meetings in smaller rooms that would be easier to heat, and removing vegetation from the building to allow better sun penetration has seen a dramatic reduction in energy bills. They have also raised awareness in the Parish encouraging others to take action on energy conservation at the church and in their homes. Joining the program in July 2014 Bond Hair Religion took on the challenge of implementing environmental practices into this Kingston salon. From the initial audit and Actsmart advice they installed eco showerheads, started using Easydry towels to reduce towel usage, updated old lights to LEDs, and implemented recycling whilst reducing the amount of packaging coming into the salon. In just over twelve months Bond Hair Religion have increased recycling from 0 to 80% and reduced electricity costs by 60%, all while increasing number of clients serviced. Environmental stewardship is one of the four pillars of this organisations’ Corporate Social Responsibility Strategy. Committed to reducing greenhouse gas emissions, reducing consumption, avoiding unnecessary business travel, reducing and recycling waste, videoing and web conferencing and walking to meetings are all encouraged. A system of continuous improvement and strong staff induction and commitment has seen a reduction of business travel emissions by 29%, waste to landfill by 92% and energy consumption by 63%. The management ethos includes educating the future leaders of tomorrow to show respect for their environment. Daily activities include repurposing old furniture into craft centres, teaching water, waste and energy saving tips for children to take home to their families, and collecting and recycling plastic bags in the centre. This is a great example of teaching the next generation about sustainability, reaching many homes within Canberra. TEDxCanberra is a non profit, volunteer run organisation that holds one major event in Canberra each year. The 2014 event embarked on the goal of zero waste to landfill – an ambitious target for any event. Engaging the volunteer team, addressing every level of the event and engaging suppliers to reduce generation of waste saw the event with 650 attendees send only 2 litres of waste to landfill. This auction portal is unique to Canberra. All auctions of obsolete equipment from local schools are available Australia wide with funds being put towards a 3D printing package including training to help that school bring future technology into the curriculum today. Any equipment with no commercial value is sent to recycling. This innovation has the ability to change behaviour and perspective of what is increasingly a throwaway society. The team at the AIS worked together with local worm farmers to develop a state of the art worm farm onsite. Organic waste is collected from all sections of the AIS including athlete’s accommodation, staff kitchens, child care centres and from events. This has seen a significant reduction in waste removal costs which will be realised well into the future. Jancye has developed complex waste management contracts to address waste removal to optimise recycling at the Multicultural Festival. Her ability to innovate, collaborate and deliver this event with sustainability at front of mind is a credit to Jancye and her leadership, and has resulted in outstanding results in reducing waste to landfill from the event.